Inky Fairy Designs: Let's hear it for the boys!!! Hey, everybody! If you've been keeping up with this week's previews at The Greeting Farm, you know we're right in the middle of a FULL week of October previews and the excitement is building! We are BURSTING with excitement about what's to come in the next few days, not to mention our FIVE amazing October releases! I have to tell you, I am IN LOVE with these build a onesie sets!!! I can't stop playing with them and for my preview I just HAD to make a gift bag. That little car matched so perfectly with the Echo Park papers. It's just so much fun making different little onesies with different images inside and because they are clear you can see exactly where you are stamping each & every time. I also have a set of gift tags I also made that I'm saving for another day!!! I have to tell you, it's never been easier to make pleated ribbon like that than when I use Helmar 450 Quick Dry!! Just a quick pinch and it's set. LOVE it! :D I also used Acid Free glue to adhere all my pattern paper to the bag & zap dots to give the onesie some dimension. Don't forget to visit the TGF BLOG today to see who else has some cute couture for a boy to show you today! I hear there's a set up for grabs there, too, so be sure to find out how you can enter to win! See you soon! 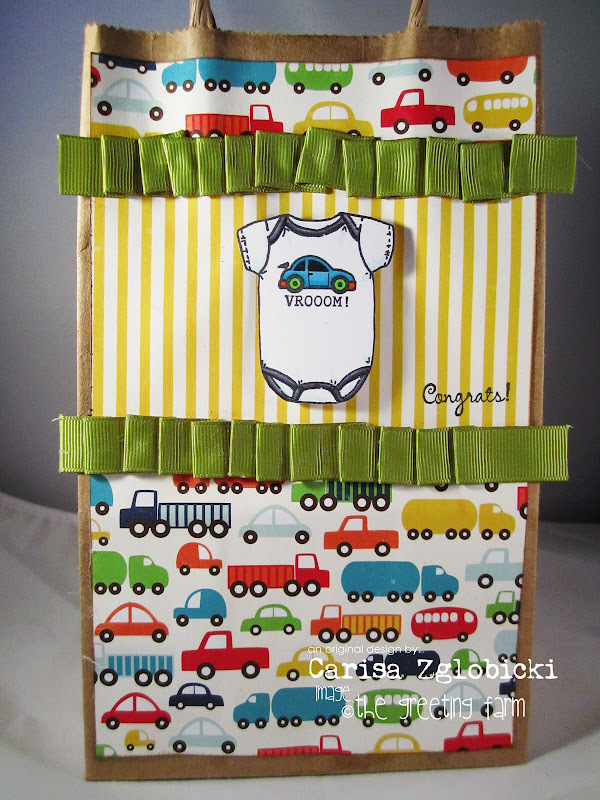 What a cute card, love the pattern paper!!! Wow, I LOVE this gift bag! What an awesome idea and the car on the onesie is a PERFECT match for the DP! Love the new set, SUPER cute! Fabulous gift bag Carisa, just love the colours and the little cars papers, gorgeous pleated ribbon,great job. Oh my gosh!!!! this is SOOO cute! I love it! What a great bag!! Hey Carisa. This is my favorite project of yours ever!!!! I love love love it! I NEED this set! Glad the boys weren't forgotten. The car is perfect for the paper. Super cute, Carisa!! Love the little car and the DP is perfect!! So cute and love the vehicles theme. Absolutely darling! awe love your gift bag! it is sooo darn cute!!!! This is so stinkin cute... I love it..
Love the gift bag! Super job...guess you already knew that, huh? Well...just telling you again. HEE HEE. What an adorable gift bag you made! Great Job!!! what a cute new set too! You're right, this is so perfect with the EP papers. I can't wait to see more of this set! i love that you made a gift bag! and i'm right there with you, i think i'm going to love building onesies too! :) thanks for sharing your talent! Your creation is ADORABLE and FUN!!! totally boy!! So cute Carissa! Love the gift bag idea, and this set is as cute as can be!